Jupiter, FL – March 3, 2015 – Horse Radio Network’s once-a-month Para-Equestrian Show featured Todd Flettrich and Shannon Dueck with hosts Lindsay McCall from the United States Para-Equestrian Association (USPEA) and co-host Regina Cristo. To listen to episode #300, please visit: http://www.horseradionetwork.com/2015/02/26/dressage-radio-episode-300-by-uspea-dressage-partnerships-with-flettrich-and-dueck/. Todd Flettrich: From being an Olympic contender to coaching some of the best riders in the world to international success, Flettrich is a veteran of the competition arena and sought-after trainer and mentor. Todd Flettrich is a veteran competitor and trainer at the FEI levels of dressage. He began riding at the age of 12 and trained with such well-known horsemen as Jessica Ransenhousen, Robert Dover, Odet Shimoni, Sue Malone Casey, Steffen Peters, Kathy Connelly, Christine Traurig and Hubertus Schmidt. Shannon Dueck: Born in Austin, Texas, Shannon grew up outside of Vancouver, Canada. Her mother Jacqueline Oldham was an “S” dressage judge in both Canada and the USA, and instilled in Shannon a love and knowledge of classical dressage from an early age. Shannon was lucky enough to grow up with horses in her backyard, and evented to Intermediate level as a teenager, as well as show jumped and worked on the Thoroughbred racetrack. She went through the Pony Club levels to attain her “A” status at the age of 18, and also got her Canadian Coaching Level 2 status. After completing a Bachelor’s degree in Animal Science at the University of British Columbia and a Master’s degree in Equine Nutrition and Exercise Physiology at Texas A&M University, she went on to become faculty at Lakeland College and Olds College in Alberta, Canada, and then moved to Massachusetts with her husband Lorne to take up a faculty position at Johnson & Wales University. In 1994, Shannon spent many months training in Holland as a working student for Bert Rutten – this was when she decided to get serious about dressage. She rode in her first international competition in 1995 in California, and was long-listed for the Canadian Equestrian Team in 1996 with her mother’s Madison. In 1995 she sold her last event horse and bought her first real star, Korona, as a 3 year old from Bert Rutten. Shannon trained Korona from the beginning. The partnership was very successful, beginning with an Individual Silver Medal at the Pan Am Games in 1999, they never looked back. Korona and Shannon represented Canada successfully at the Grand Prix level for many years. In 2002 at the World Championships in Spain they were the top Canadians, finishing 23rd in the Grand Prix and 25th in the Grand Prix Special. After winning the Canadian League World Cup Final in 2002, they represented Canada at the World Cup Final in Sweden in 2003. In 2003 they were also a part of the Canadian Team at the Open European Championships in England, which secured an Olympic berth for the Canadians at the 2004 Olympic Games. In 2004 they had a very successful training and competition tour in Holland, Germany and Austria, but did not get to represent Canada at the Olympics – Korona was ill during the Canadian Olympic Selection Trials. Since those days, Shannon has been busy training other horses and riders from Training level to Grand Prix. The many horses she has trained to the FEI levels and competed successfully on include Leoliet, Pegasus, Amazing, Ringo Starr, Control IV, S Infinity, and Sentimiento II. She absolutely loves teaching her students both at home and at the shows, and many of her students have been with her for years. It took her many years to find her next international superstar, but she bought Ayscha in Germany from a friend as a 6 year old. Ayscha was supposed to be sales project, but Shannon soon found out that she had talent for Grand Prix, and decided to keep her and develop her as far as possible. With very limited show experience, Ayscha began Grand Prix in 2010 as a 9 year old. Shannon and Ayscha were part of the Canadian Team which traveled to Europe with Robert Dover and they competed successfully in many international shows in Germany that summer. In 2011 Ayscha and Shannon headed to Great Britain to train with Carl Hester, where they competed at Hickstead and London Olympia as well. Shannon has had wonderful coaching all her life, from the very beginning with Klaus Albin and Dietrich Von Hopfgarten in Langley British Columbia with her event horses. 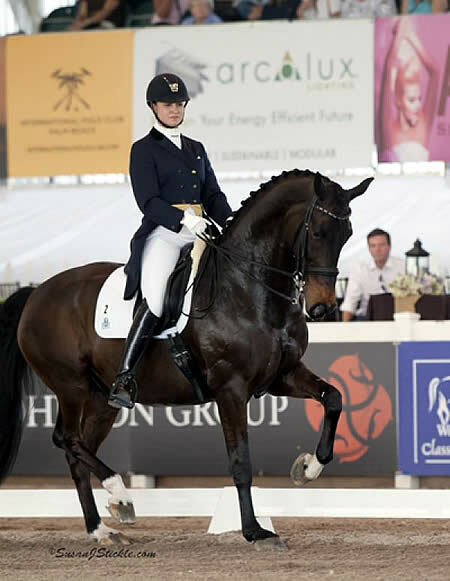 In her adult life she has had extensive help from Bert Rutten of the Netherlands, Lars Peterson of Denmark, Kathy Connelly, Robert Dover and Steffen Peters of the USA, Hubertus Schmidt and Wolfram Wittig of Germany, and most recently, Carl Hester of Great Britain. Rebecca Hart and Schroeters Romani. Photos by Susan J. Stickle Photography. 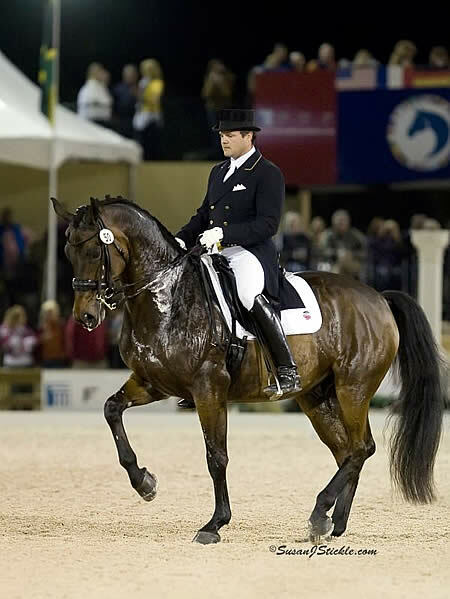 West Grove, PA – September 26, 2014 – Todd Flettrich is an internationally recognized dressage rider and trainer. Rebecca Hart is one of the brightest stars of Para-Dressage. When the two joined forces, they became an unstoppable team of positive energy and excellent horsemanship. Hart, a Grade II Para-Dressage athlete with birth-onset hereditary spastic paraplegia, is a two-time paralympian and an incredible six-time USEF Para-Equestrian Dressage National Champion. Prior to the 2010 World Equestrian Games, Rebecca’s primary trainer, Missy Ransehousen, asked professional dressage rider Flettrich to help polish Rebecca’s performance during her final preparations for the event. Since then, he continues to work with Hart before many major events. The relationship between Hart and Flettrich has grown and strengthened over time and through several mount changes for Hart. They work together because they feel it’s a mutual learning experience. For Hart, the first meeting with Flettrich actually swept her off her feet. Flettrich’s training style worked well for Hart. She enjoyed great success competing one of her early international horses, Norteassa (nicknamed Pippin). Hart qualified for the 2012 London Paralympic games with her new mount Lord Ludger and, again Flettrich was there to polish and perfect Hart’s riding prior to the big competition. With his help, Hart finished in fourth place, just shy of a medal. After his impressive career, Lord Ludger retired and Hart began the challenging search for a new international mount. With the generous support of Margaret Duprey, owner of Cherry Knoll Farm, they purchased the 12-year-old Danish Warmblood mare, Schroeters Romani. Flettrich shares Hart’s confidence in her new mount and said having Romani has made teaching her easier. This March, Hart and Romani tackled their first big CDI at the Adequan Global Dressage Festival 12 CPEDI3*, with Flettrich helping to train them prior to the event once more. Through hard work and training with Flettrich, Hart and Romani solidified their bond and began to set sights on the Alltech FEI World Equestrian Games. After she claimed her sixth U.S. National Championship in June, Hart took Romani to France for the 2014 Alltech FEI World Equestrian Games (WEG). The pair qualified for the Freestyle after finishing in seventh place with a score of 67.486 percent individually. While Flettrich could not be in Normandy, he was confident about Hart’s abilities and said he didn’t need to give her any advice. With the help of her trainers and mentors, Hart has climbed to 25th position in Para-Dressage on the FEI’s World Individual Ranking List. “I’m so grateful to all of the people who have helped me along the way, Margaret, Todd, and Missy,” Rebecca said. For more information on Cherry Knoll Farm, please visit http://www.cherryknollfarminc.com/. Wellington, FL – February 18, 2013 – The international quadrille team sponsored by The Seley Parker Group of Merrill Lynch plans to give their competitors a run for their money at The Challenge of the Americas (COTA) presented by SSG Gloves on Saturday, March 9. Team International The Seley Parker Group of Merrill Lynch has been practicing an intricate quadrille for The Challenge and its 11th anniversary return as a one-of-a-kind affair highlighting the equestrian sport of dressage. Competing riders include the “Who’s Who” of top equestrian competitors in the United States, Canada, Latin America and Europe riding in team quadrilles to Play for P.I.N.K. to help raise funds for breast cancer research. Team International is comprised of dressage stars Todd Flettrich, Catherine Haddad-Staller, Susanne Hamilton, Nancy Later, Sharon McCusker and Cherri Reiber. The coaches for the team are Ruth Hogan-Poulsen and Erin Swaney. Susanne Hamilton, a United States Dressage Federation (USDF) Gold Medalist and one of the team riders, said she went to her first Challenge of the Americas six years ago with her friend, Ingrid Lind, who lost her fight with breast cancer three years later. The other coach and choreographer, Erin Swaney, an FEI rider and trainer, said she started helping with The Challenge in response to COTA organizer Mary Ross’ request. She said that since she has been one of the coaches for the quadrilles, she strives to make the choreography fresh and jots down ideas for the freestyle throughout the year, paying special attention to visual excitement from every angle for the audience. Aside from the serious theme of fundraising for breast cancer research, fun is a central theme to all the riders on the team. Catherine Haddad-Staller, a two-time Grand Prix winner in the U.S. and a USDF Gold Medalist, agreed. “I think it’s a worthy cause and I am quite excited to be a part of the international team,” she said. This is Nancy Later’s first year to participate as a rider in the quadrille and she said she is helping support organizer Mary Ross in her effort to fund breast cancer research. Later is a USDF Bronze, Silver and Gold Medalist. To learn more about The Challenge of The Americas, visit www.challengeoftheamericas.com. For tickets, contact Mary Ross at (561) 433-0988 or by email at Anglot@aol.com. 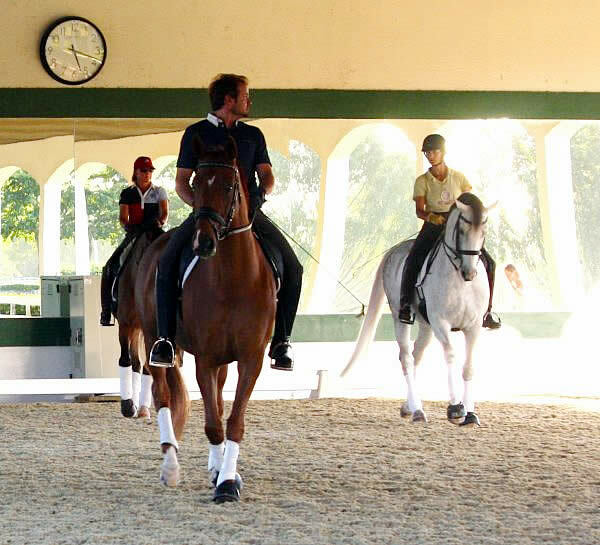 Wellington, FL – May 31, 2012 – Olympic hopeful Todd Flettrich and his equine partner, Otto, are hard at work getting ready for the USEF Olympic Dressage Selection Trials in Gladstone, NJ. 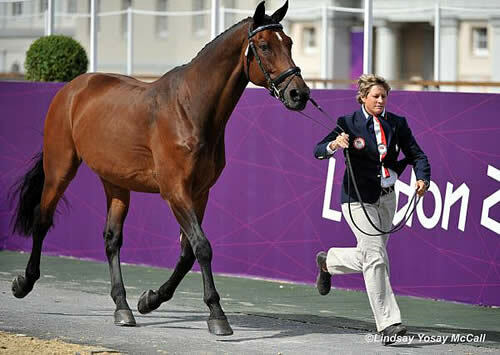 The selection trials will decide which horse and rider teams will represent the United States in dressage at the 2012 Olympic Games in London. The trials will be held at the United States Equestrian Team (USET) Foundation headquarters June 8-10 and 13-14. In order to get closer to New Jersey, Flettrich and Otto recently returned to their summer home in Pennsylvania. 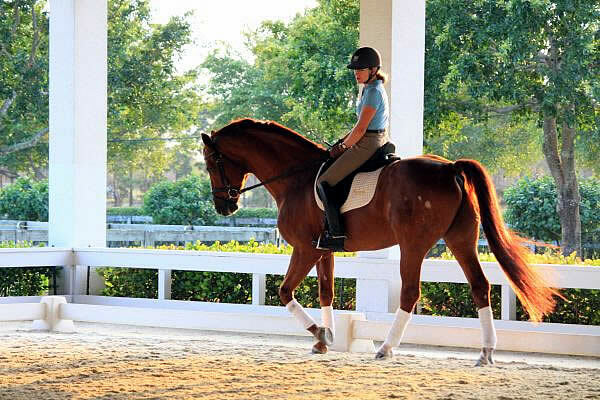 The two had a successful winter show season in South Florida and were training in Wellington, FL, with Oded Shimoni, the U.S.-based Israeli coach who has proclaimed them both fit and strong. The dynamic duo of Flettrich and Otto remained in Florida as long as possible before the trials to stay acclimated to the heat and humidity. 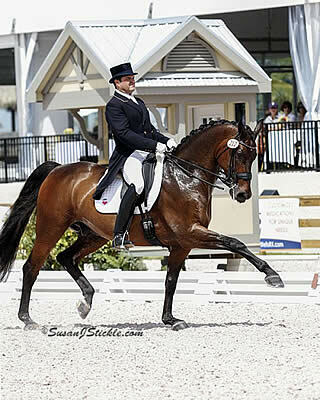 Wellington, FL – February 19, 2012 – Todd Flettrich of Wellington, FL won the FEI Olympic Grand Prix Special at the $50,000 Florida Dressage Classic CDI-W, presented by the United States P.R.E. Association, on Sunday. 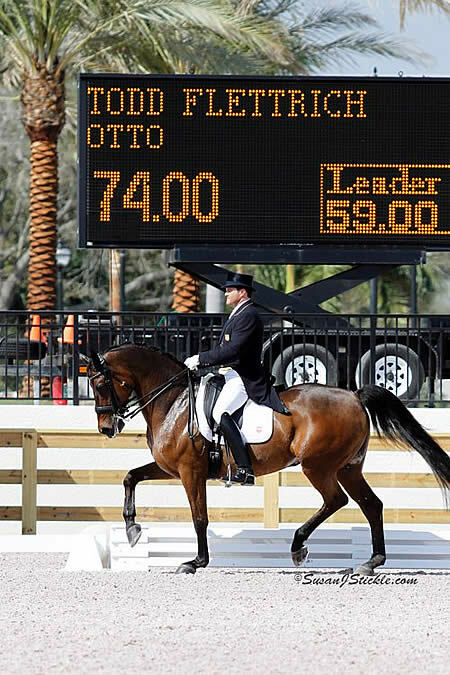 Riding Otto, his 2010 World Equestrian Games (WEG) partner, Flettrich scored 71.422%. Ashley Holzer of Canada finished second on Breaking Dawn with 70.800% and Heather Blitz came in third on Paragon by a fraction of a percent less scoring 70.756%. Flettrich was thrilled with the performance of the 16-year-old gelding and the score; it was their second highest in the Olympic Grand Prix Special. 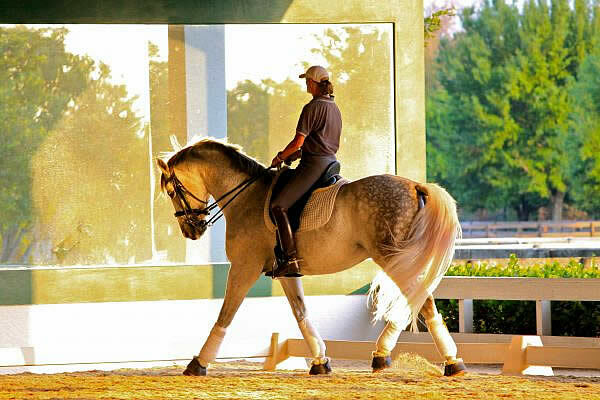 Wellington, FL (January 28, 2012) – At the World Dressage Masters Palm Beach presented by International Polo Club Palm Beach, Adrienne Lyle of the United States bested the international field to win the Grand Prix Special at the Jim Brandon Equestrian Center on Saturday afternoon. The 26 year old Idaho-based rider scored 73.244% riding Wizard, a 13 year old Oldenburg gelding owned by Peggy and Parry Thomas. “My horse handled everything beautifully. 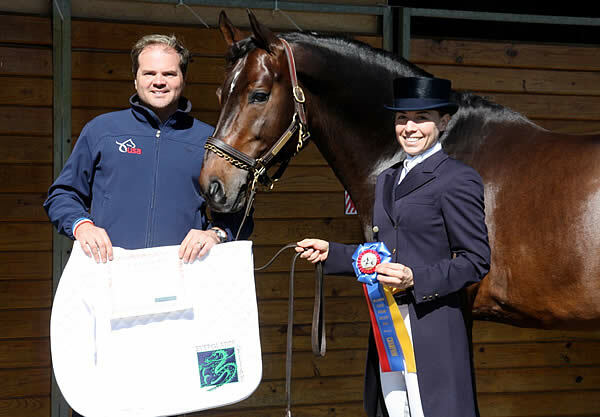 I’m really excited and happy,” said Lyle, who placed fourth in Friday’s WDM Nürnberger Grand Prix, and was eligible to compete in the Grand Prix Freestyle, though she opted to ride in the Grand Prix Special instead. “As much as I would have liked to ride in the freestyle, I need a Grand Prix Special qualifying score for the Olympic Selection Trials,” she explained. Wellington, FL (January 10, 2011) – The Wellington Classic Holiday Challenge ended the year on a good note for dressage rider Catherine Malone, who rode away the Everglades Dressage Overall High Score Adult Amateur Award at the show. Sponsored by Everglades Dressage Farm and Bethany Peslar, Malone won the High Score Award with a 66.026% in the USEF National Young Adult “Brentina Cup” Test of Choice. Lexington, KY – October 8, 2010 – Todd Flettrich and his grand prix mount Otto were recently a part of the United States Dressage Team that competed during the 2010 Alltech FEI World Equestrian Games (WEG) in Lexington, KY. The pair finished with a great score in the FEI Grand Prix and Flettrich left Kentucky happy with his consistent results and a fun experience riding for his country. Flettrich considers it a great honor to have been a part of the United States Team at this year’s WEG, and believes the competition was a positive stepping stone toward his future goals. 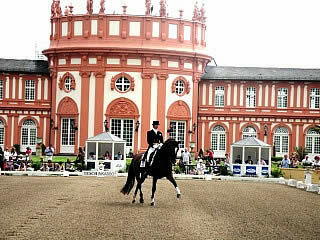 Flettrich has made it his main goal to compete in the 2012 Olympic Games in London and feels that his horse and his riding show improvement with each international competition. During WEG, Flettrich showed first for Team USA on the opening day of dressage competition with his mount Otto, a 14-year-old Danish Warmblood gelding owned by Cherry Knoll Farm. The pair finished in the 38th position out of the world’s very best horses and riders.